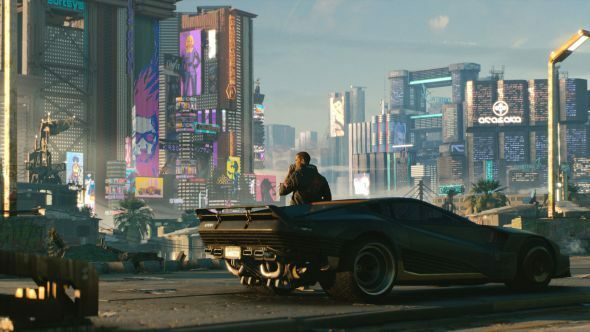 Cyberpunk 2077 is going to be a huge game, CD Projekt Red has already said it’s too large to measure (at least in the same terms as The Witcher). On top of that, the team “isn’t using any procedural methods to create the environment”. Instead all of the Cyberpunk’s environments are designed and created by the artists. With everything going on this week, keep on top of things with our comprehensive E3 2018 guide. The focus on readability is because CD Projekt Red is a world centred around verticality. This means you will often be looking at an environment from above or below, which doesn’t give you the best viewing angle to take in what you’re seeing, and the artists have to draw your eyes to what is important. Cyberpunk’s city is split into six distinct districtsand within those districts are megabuildings, vast structures split into many levels. On each floor you have access to you’ll find many unique NPCs, storylines, and secrets to uncover. CD Projekt RED want these locations to feel well-defined and to achieve that team won’t use procedural generation methods. We don’t knowCyberpunk 2077’s release dateyet but hopefully we won’t have too long to wait to see how effectively CD Projekt RED have pulled it off. If a lot of the game is going to be set inside, I hope they’ve found ways to stop it from becoming too claustrophobic. Otherwise it runs the risk of feeling like you’re in the Dredd movie.